7.5.3 How much time should I wait for an Element or Text? Codeception PHP Testing Framework is designed to work just out of the box. 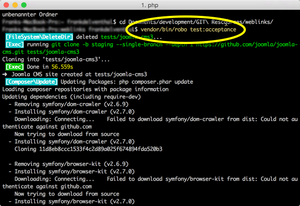 This means its installation requires minimal steps and no external dependencies preinstalled (except PHP, of course). 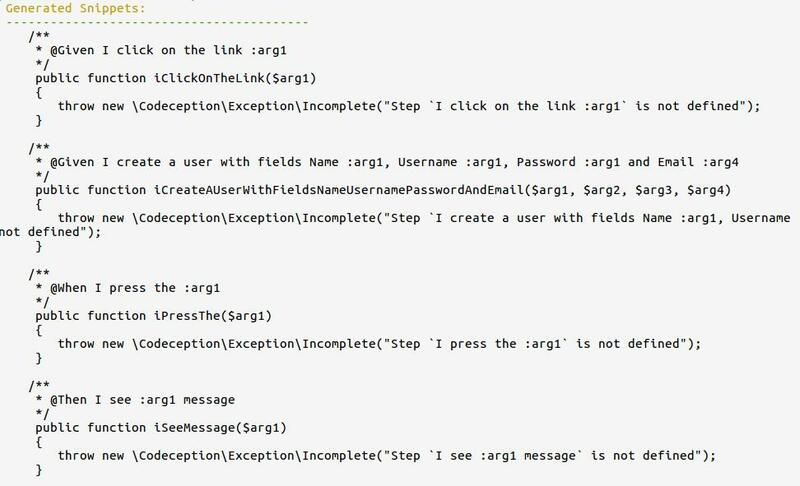 Only one configuration step should be taken and you are ready to test your web application from an eye of actual user. Codeception provides possibilities to do Unit Testing or to Test APIs, however this page is focused in System Testing. - System testing uses a production-like environment to verify the system as a whole, including user interfaces, databases, web servers, logging, etc. - A unit test verifies a single behavior of a single unit – this can be a function, a method, or a class. A logical unit is something that can be reasoned about in isolation. The unit must be completely under your control. The test should limit the number of other units it touches on, and should not touch any part outside of your own system. As such, the test should only fail for one reason. - Integration testing means we’re verifying that that different units are working together. It focuses on the interfaces between components. Some of these components may be from third parties. When they break, they signal that, although individual units may behave correctly, something changed in the API that caused failure in another place. Often, integration tests are slower than unit tests. As mentioned at the beginning of this text, the current page is focused on System Tests and more specifically using Webdriver. The reason is that we came to the conclusion that this type of tests combined with the already existing Unit tests in Joomla are the most successful way to test our current code. Why use Codeception when we already have Selenium IDE? Codeception works great with Selenium. But with Codeception you can write your tests in PHP. The main reason is: Selenium IDE tests are tightly bound to XPath locators. If you ever change anything in layout tests will fall. Codeception locators are more stable. You can use names, labels, button names and CSS to match elements on page. Each page on your application has a class which we call page objects, each page class will have information about the URL, fields, Text present on the page. We use the best possible selector for any field on the page. When this document is created Codeception 2.0 was not having a PSR-4 compatible autoloader. Therefore we are creating a convention so with the future Codeception 2.1 with PSR-4 compatible autoloader (https://github.com/Codeception/Codeception/pull/1228) we are creating a naming convention for Pages so it will cost us a small effort to move to autoloaded classes in the future. Step Objects are classes which contains steps which are to be executed on the application to perform certain operations, step objects make use of page objects to perform these actions. To get the test environment running you need to have several components installed. Important note: no matter if you are executing Joomla CMS Tests, Weblinks, or tests in other Joomla extensions, in any case you are asked to fork the repository into your local machine under your htdocs folder of your local web-server. 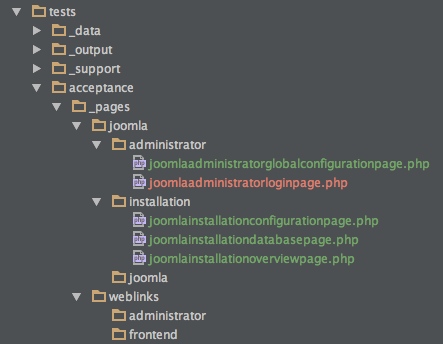 The reason is that, the automated scripts that launches the tests use the repository files for the tests. If you are not familiar with setting up a local web-server, learn that first before you advance futher. The JRE has to be installed, so the tests will be executable. You find the recent versions at the Oracle Website. In end of May 2015 this is: http://www.oracle.com/technetwork/java/javase/downloads/jdk8-downloads-2133151.html later on that link could be obsolete and should be changed if there is a newer version out. Newer Mac OS Versions are not shipped any more with the JRE, so they have to download that too. 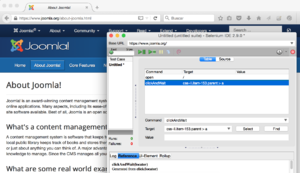 Selenium is testing in the browser Firefox. The selenium version is not that quick with the updates, as the Firefox browser, if the test is not executable, then it can be that you manually have to install an older version of Firefox. Sadly that can be a try and error thing. To get older versions of Firefox: https://ftp.mozilla.org/pub/mozilla.org/firefox/releases/ here you will find many folders. Just try the first one that came before the Firefox version that you have been using (and that did not work). In the version folders you will find folders for all the different operating systems. In your the folder that you installed, downloaded, pulled (git) the project, you have to rename the "acceptance.suite.dist.yml" file to "acceptance.suite.yml" and configure the parameters to your system variables. 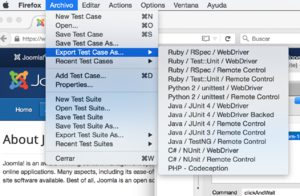 Once your machine is able to run tests (see The Joomla Browser Module), you are able to start working. 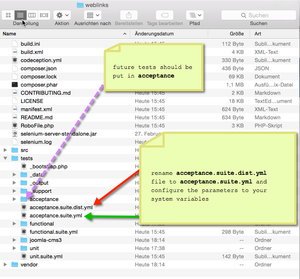 Check the contents of the /tests/ folder in weblinks and try to understand the structure of the tests. For each function you have a directory and sometimes a configuration file, both will have the corresponding name. In Joomla we give priority to Readability over Performance, even when performance is a must. To explain that let me show an example: Let's say that we want to fill a field Username in a login form. However Codeception is a smart framework and it adds some magic to it's methods (see: https://github.com/Codeception/Codeception/blob/2.0/src/Codeception/Module/WebDriver.php#L511-L513). It allows me to write more readable tests (keeping performance hight). Codeception will be smart and will search first in the page if there is any "LABEL" called Username. That is a fast operation, so performance will be affected just a little. And instead we have written less code than in previous examples. Still there is a definitive method of using locators that made them readable and performant called: strict Locators see Testing_Joomla_Extensions_with_Codeception#Writting_reliable_locators. In conclusion we have more readable tests and less code to maintain while keeping performance. That is a win! There are two ways to get and run codeception, via PHAR or via Composer. Using Composer is recommended (because we are using in some tests the Codeception 2.1 development version not available in the composer.phar). If the Apache2's port is occupied ,you either remove the other server or stop the other server. Writing good locators can be tricky. The Mozilla team has written an excellent guide titled Writing reliable locators for Selenium and WebDriver tests. Losing 30 seconds in every Assertion can delay your tests dramatically. Therefore, remind always to add xPath locators to all your Assertions. A page could have mutiple elements which can have alert css class associated, hence being more specific helps. How much time should I wait for an Element or Text? But, how much time is the right time to wait for a text? PHP maximum execution time before returning a Fatal Error for timeout is set by default to 30 seconds. We suggest to set it for 60 seconds, because running the tests in slow computers can easily get to that time in some tasks. If a waitForText command takes over 10 seconds, it will much probably mean that something is not performing well. Maybe a non Strict Locator is being used and Selenium takes to much time to find the element. However we have even identified cases were some steps take longer than 30 seconds in very slow computers, specifically installing joomla, see https://github.com/joomla-projects/joomla-browser/commit/b70f195140e599649cf98f051d7a31388c4f1632. For this cases we can't do much, other than recommend to add more memory to the local web server. Codeception allows you to generate user-friendly text scenarios from scenario-driven from Cest and Cept php test (see http://codeception.com/docs/reference/Commands#GenerateScenarios). I wait for text ""Congratulations! Joomla! is now installed. ""," 30"
I wait for text 'Congratulations! Joomla! is now installed. '," 30"
wouldn't be much better to write something like this instead? When you find yourself writing a very complex locator in a test, is maybe because the markup of the Website is wrong. For this cases, is better to stop writing the test and reconsider the possibility of modifying the website that we are testing. There is nothing that prevents us to improve Joomla markup. Actually is the other way around, with these fixes we are probably making Joomla more accessible. We have had experiences in the past, see for example this issue: https://github.com/joomla/joomla-cms/issues/7207. In conclusion is much more convenient to add just a simple class to the element to easily locate it instead of becoming mad finding the right xPath. Remind that is important that our tests are readable, and that has to do with using readable locators. Where projectname stands for the name of the project in which we are adding this locator. Is important that the rest of Joomla coders know that this test-projectname- prefix is used by the tests to prevent anyone from removing it. This recommendation was originally suggested by Davert (the creator of Codeception) at http://phptest.club/t/codeception-tips-tricks/14/8. One can use the Selenium IDE with the codeception Formatter to export the tests to Codeception Framework Format. Using the Selenium IDE to write the tests seems way easier than writing them in PHP (since you have immediate feedback on what's going on the page), but it also poses some issues. For the most part the Joomla-Browser has functions that we can use to do standard stuff like login, logout etc. If we do our tests with the Selenium IDE we cannot use those and our tests get filled up with stuff that we have already abstracted. That is again a technical solution to a test that should have been easy in the first place. We get into the same trouble with selecting a date out of a Calendar field. So at the end it seems pretty difficult for non-developers to create tests that we could use, because most of the steps recorded by the Selenium IDE won't work a second time. As far the codeception Formatter is concerned - it hasn't been updated in 2 years, but if we find out how to use the Selenium IDE extending the formatter and building on top of it shouldn't be a show stopper. BDD (Behavior-driven development) in its grandest sense is about communication and viewing your software as a system with behaviour. Using BDD approach to write test cases make test cases easy and understandable. BDD test cases can be understood by non developers and testers. Gherkin is the language that codeception uses to define test cases. Test cases were designed to be non-technical and human readable, and collectively describes use cases relating to a software system. Gherkin is a line-oriented language most lines start with a special keyword. Lines can be comment by using hash sign(#). Gherkin test cases are saved in “.feature” file format. You can write gherkin in any editor (Like PhpStorm, Sublime,Gherkin editor, and any IDE). Use can use Tags (“@”) to organize features and scenarios. Descriptive text of what is desired from all the test cases inside that “.feature” file. Basically it is a description of feature which is going to cover by below test cases. Background contains set of steps that all scenario need to perform at start. When Login into Joomla administrator with username "admin" and password "admin"
Description of test case what test case is going to test, In short it is test case name with some description. A scenario is a sequence of steps through the feature that exercises one path. Given: This sets up preconditions, or context, for the scenario. When: This is what the feature is talking about, the action, the behaviour that we're focused on. Then: This checks postconditions. It verifies that the right thing happen in the When stage. And: If we have consecutive “given, when or then” then instead of using these we use “And” statement to make it more readable. But: Same as “And” but used in negative prospect. Given I click on the link "Create an account"
And I create a user with fields Name "patel", Username "patel", Password "patel" and Email "patel@gmail.com"
When I press the "Register"
The scenarios within our `.feature files` consist of steps, also known as givens, whens, buts, thens and ands. Technically these kind of steps are the same. When we executing the feature, each step is matched to a PHP function. Then I check available tabs "Account Details", "Assigned User Groups" and "Basic Settings"
So, why are there these different step names? Behaviour-driven development (BDD) means that you can turn an idea for a requirement into code simply, as long as the requirement is specific enough that everyone knows what’s going on. We need a way to describe the requirement so that everyone – user and developer – have a common understanding of the scope of the software. Our tests can only be successful if we have the same semantic understanding of the steps Given, When and Then! The purpose of Given is to put the system in a known state. What is the context of the system? What pre-condition must be true before the action is tested? What relevant data is in the system? Important in this context: In most of our .feature files we use the the section Background. The background is run before each of the scenarios in our .feature file and also has impact on the state. Given I search and select the user with user name "register"
The purpose of When is to describe the key action that will be performed. What will be tested? What relevant input data will be tested when the action occurs? Given I search and select the Access Level with name "Acl Two"
When I Delete the Access level "Acl Two"
Then I should see "No Matching Results" for deleted user "Acl Two"
When I unblock the user "User Two"
And I activate the user "User Two"
Then I should see the message "Hi User Two,"
The purpose of Then is to observe outcomes. The observations should be related to the business value/benefit in our feature description. In response to the action, what is the observable outcome? What are the expected results? What is the post-condition or output data observable by the user? Then Login in backend with username "User One" and password "pass1"
Please note: We should only verify outcome that is observable for the user. It is not enough to verify that all entries in the database are correct! When I don't fill Login Name but fulfill remaining mandatory fields: Name "User Two", Password "pass2" and Email "user2@example.com"
Then I see the title "Users: New"
Then I see the alert error "Invalid field:  Login Name"
But I see the alert error "Invalid field:  Login Name"
Steps beginning with And or But are exactly the same kind of steps as all the others. That will output all the "step" methods in .feature files. Copy all this snippets and put into step file. How to Create a step file?